Big day? Already got loads on? Similarly you have no time to arrange travel for everyone individually? Why not give us a call on 01709 306303 and our professional and courteous members of staffs will find a bus to match your specific needs. Your big day is supposed to be full of enjoyment and celebration. However the period leading up to the day can be very stressful. Here at Advanced Travel, we aim to provide a professional, safe and stress free travel experience. As a result, booking one of our buses for your special day can be very beneficial. As a result, the cost of transporting you and your guests will be slashed. Your guests won’t have to worry about locating the venue. 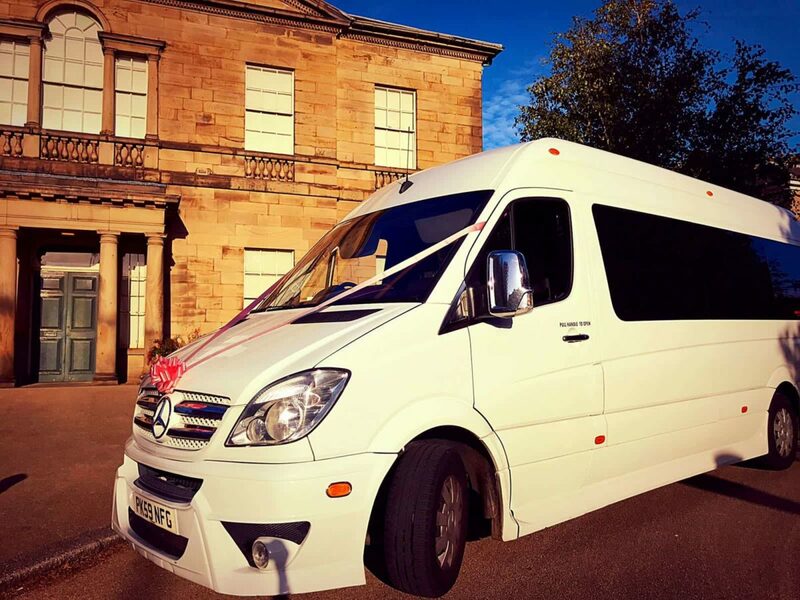 By travelling in style and comfort, they will arrive feeling refreshed and exited, improving the overall atmosphere of your big day. Travelling together will ensure that everyone reaches the destination safely and on time. From previous experiences, we have observed that travelling together provides a great environment for your guests as everyone can converse and are in a joyful mood. Giving Advanced Travel the ability to take control of your travel arrangements is something you won’t regret. Whether you are travelling short distances, long distances, have one stop or a few stops, whatever your preference is we will not disappoint. In our fleet consisting of over 20 vehicles we have something for every occasion. Our drivers are always professionally presented and have attributes that can not be matched. They are always willing and able to help. Our vehicles can be specifically decorated inside and out depending on your request. From ribbons to lighting, everything can be altered so that you are content with your choice of vehicle. We understand that sometimes you may want privacy as bride and groom. In addition, why not check out our highly specified top of the range Mercedes E-class Saloon which comes chauffeur driven. Therefore, with everyone travelling comfortably and together we aim to get everyone to the destination safely and on time. To find out more visit our Chauffeur Hire page. With the numerous other tasks you have when planning a wedding or special occasion, why not leave your travel arrangements to us at Advanced Travel and we guarantee you will be satisfied with our service. So pick up the phone and give us a call on 01709 306303 or visit our Get a Quote page for a free personalised quote.